Height: 75 cm / 29 in. 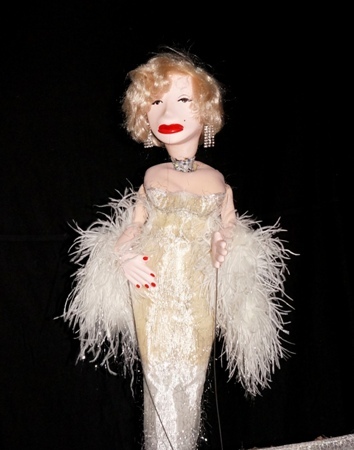 MARILYN MONROE - rod puppet (75 cm/ 300 g) with moving head, lips, breast and hands, a parody of Marilyn Monroe from the movie "Some Like It Hot". The puppet is operated by one puppeteer. Materials: papier-mâché, styrofoam, foam rubber, metal wire, fiber plastic, fabric, ostrich feathers, glass furniture.